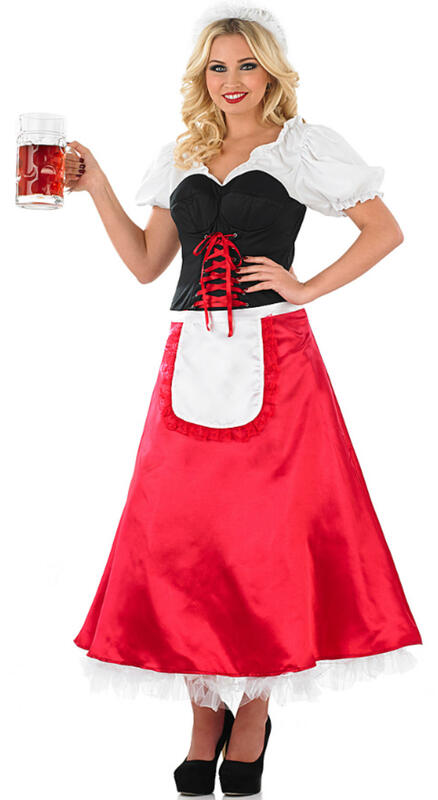 Come travel across Germany and enjoy the beer festivals in October while wearing their national dress in this Bavarian Lady costume. Dress according to the people of Bavaria in this long red dress with lace under-dress attached to a white puffed-sleeve top covered by a black bodice that is tied together by red ribbons. There is also a small apron around the waist as well as the included white bonnet style hat. Serve your friends and enjoy in merriment as you celebrate in style at Oktoberfest themed fancy dress parties.